is, for sheets from 18-19 to 6-31, intact (although one may not in any way exclude that some transposition may have occurred within the limits of the numerical outlines shown) and, in the second place, that the order of the sheets, as Leonardo used them when writing I am referring to the connection which I have already pointed out (see notes 7 and 8 on pg. 19) between the sheets which are here considered to be the last of the Leicester manuscript, the first of the Arundel Codex and the F. manuscript. , goes from the central sheets towards the outer sheets of the volume. The material order of the Leicester manuscript is worth noting for a certain constancy and uniformity in the disposition of the text which almost always leaves a margin wide enough for the illustrations and marginal notes, for the absence of long sections crossed out (the longest is on page 6 r., and occupies about a line and a half), and also for the limited occurrence of brief corrections; for the care taken in the positioning of the capital letters (sometimes lightly embellished with ornamental strokes and dots); for the correction from small to capital letters, in many cases; corrections which are more often than not, immediate or almost. The handwriting, generally very neat, occasionally varies from a faster more careless form to a more unhurried, diligent style, indicating thus the various interruptions and resuming of work, also indicated by the differences in the shade of the ink. The propositions of a general nature are often highlighted by Leonardo through enclosure inside elongated parentheses (sometimes even by underlining them completely) or brackets; we have tried to render them in the same way in the transcription, in which we kept to the procedures Some small points should be made regarding the publication of this manuscript clarifying its transcription. The words crossed out have been printed in italics and in brackets; such italics have been substituted with a round character only where the letters cancelled out were underlined by Leonardo; in the same way as the round character has been replaced with italics in the main text where the letters have been underlined by Leonardo (the cases I am referring to occur almost exclusively for the letters referring to the figures). 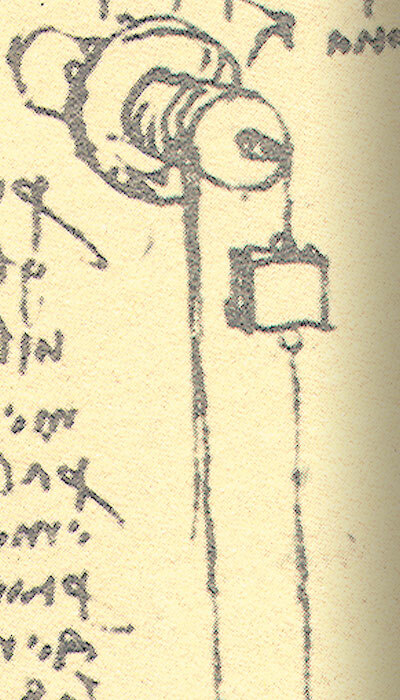 Wherever a letter has only been partially written by Leonardo, and then crossed out, I have printed where possible (in italics and in brackets, as usual) the fragment of the letter crossed out, as in the original. In the transcription it seemed wiser to print, where it was possible to interpret the partial character, the corresponding full letter, this also enabling a fuller comprehension of the text. followed in the transcription of the Atlantic Codex and in the publication of the Codex on the flight of birds and in the Anatomy sheets, by Giovanni Piumati. Below are a few notes aimed at clarifying some points in the corresponding transcription or at expressing some doubts. In the transcription the letters which were partially or totally obliterated have been reinserted where of certain deduction; where they cannot be inferred with certainty they have been omitted and shown by dots enclosed by square brackets [ ]. The omission of letters only has also been represented in the transcription by square brackets [ ], though not those depending on Leonardo�s characteristic spelling, such as when he writes �miglo� in place of �miglio�, �co� in place of �ci�, �ga� in place of �gia�, �ce� in place of �che�, etc. ; nor in those depending on common misspellings such as the failure to double a consonant where required, or the omission of an apostrophe to substitute the ��n�; nor those required when the omitted letter has inadvertently been replaced by another, for example when Leonardo writes �alla� in place of �alta�. We have tried to keep to the standard principles adopted by Piumati in previous publications, respecting those Tuscan idioms, Some traces of Milanese idioms can be found in the Leicester manuscript, an echo of the long period spent in Lombardy (see for example the words �rena rugata�, sheet 15 r.; cf. ms. M, sheet 64 v., �tachare�, sheet 27 v., �invegiate�, sheet 9 v., �Tesino� sheets 18 r.; and those personal touches which one is aware of in Leonardo�s words such as, for example, in the many cases in which a plural subject is given a singular form of the verb, or in others where the adverbial forms are made to agree in number or in gender with the adjective or participle they belong to (such as �tante abbassate� in place of �tanto abbassate�; in the words: �no�, �co�, instead of �non�, �con�; in the use sometimes of �del�, �della� in place of �dal�, �dalla�; in writing �direno�, �fareno� and the like instead of �diremo�, �faremo�, etc. ; in the endings of nouns of plural female adjectives which very often leads Leonardo to write: �parte�, �corrente�, �potente�, �veloce�, �mobile�, etc. in place of �parti�, �correnti�, �potenti�, �veloci�, �mobili�, etc. We have constantly respected these forms, making an exception only in some very rare cases for the disagreements and the adverbial forms, as above, when it appeared that failure to do so might really detract from the understanding of the text. The sentences left unfinished by Leonardo have been left exactly as they are.